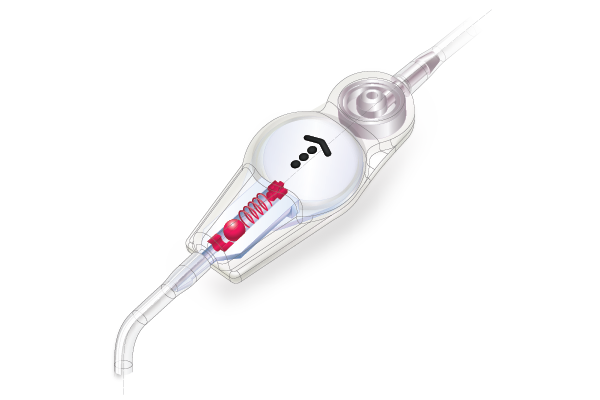 The Sphera Valve with Anti-siphon is designed to maintain the Cerebral Intraventricular pressure stable regardless the position of the patient, reducing the occurrence of overdrainage. 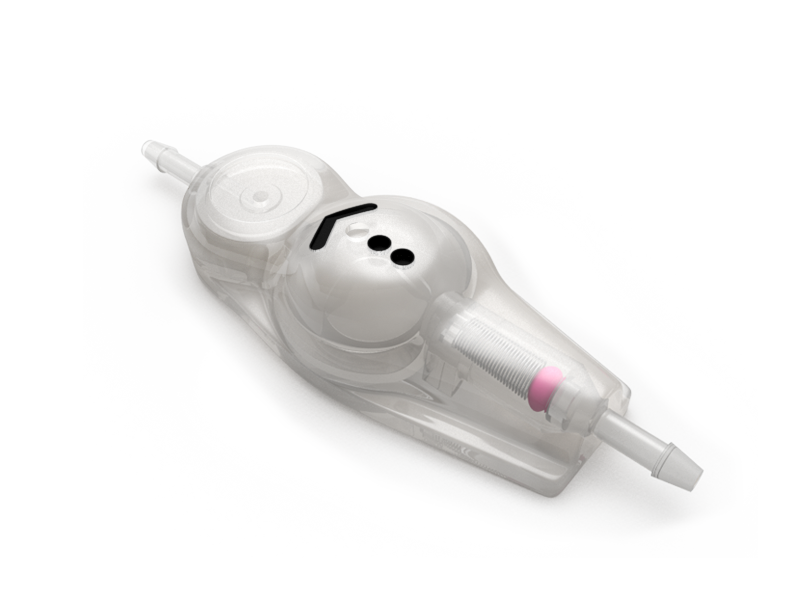 The valve is flexible, with anatomic design and low implant profile. It is made in transparent medical grade silicone with internal structure in polysulfone. It has a central pumping chamber with needle guard to protect against excessive penetration during puncture. The pressure control system is encased in the input connector. The mechanism is composed of ruby ball, stainless steel spring and conic seat. The perfect match between ball and seat can safely set the opening and closing pressure of the system, providing precise control of intracranial pressure. The valve is provided in four pressure ranges: high, medium, low and extra low to meet individual needs of patients. The input connector, manufactured in polysulfone, has radiopaque markings of flow and pressure that allows viewing in x-ray image. Encased in the output connector, the mechanism prevents ventricular overdrainage caused by siphoning in the distal catheter when the patient moves from horizontal to vertical position. The mechanism is composed of a flexible silicone membrane that when attracted by the negative pressure of the distal catheter prevents or reduces the flow of excessive fluid (fig.2). When the patient is upright, the combination of the mechanisms Anti-siphon and Sphera provides the dynamic balance of the system, keeping the valve operating on a stable flow/pressure rate. When the patient returns to the horizontal position, the Anti-siphon system stops to interfere in the control of flow and the valve returns to work in the initial condition (Fig.1). The valve is supplied with a cerebral ventricular catheter and a peritoneal catheter. These are made of soft transparent medical grade silicone with radiopaque fillet, which allows the viewing of catheters in x-ray image. The hardness of the silicone used in the manufacture of catheters was tailored to allow adequate flexibility and at the same time to prevent the occurrence of unwanted kink in the subcutaneous route, which can cause obstruction or decrease of drainage flow. The standard model comes with a straight ventricular catheter a 15 or 23.5cm length, a 90° Angle former, and the peritoneal catheter with 102 or 120cm length. Different configurations are avaliable upon request. The bands in Graphic 1 and 2 represent the range where the pressure curve operates when submitted to a progressive increasing flow from 5 to 50ml/hour. There results were obtained in “in vitro” tests. Flow of 20ml/h and 50cm of negative pressure. The graphic represents a valve operating within a range of medium pressure (7 to 11 cm H2O), initially with the patient in a horizontal position and then upright. 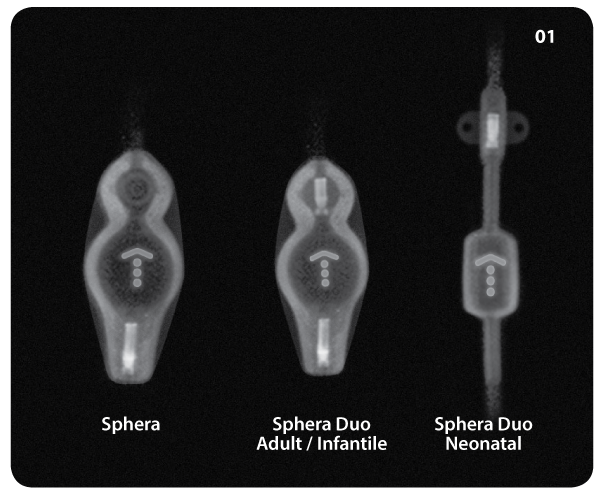 The pressure and flow direction of the valve are detectable by X-ray picture, as shown next. The arrow on the valve body indicates the direction of flow, and the circular marks symbolize according to legend pressure.